Families now have a choice of using our traditional funeral hearse or the new "Family Coach". Imagine your family being together with your loved one for the entire journey to their final resting place. Our innovative new "Family Coach" allows families to do just that, by providing the comfort and safety of traveling together to the cemetery. The "Family Coach" offers the newest in style and comfort by combining the practicality of a traditional hearse with the comfort and spaciousness of a luxury coach. 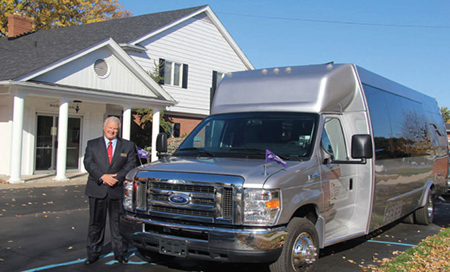 The "Family Coach" is offered exclusively through Eggleston Meinert & Pavley Funeral Homes. A family tradition since 1911. It was so comforting for us to be able to ride to the cemetery with our loved one. It was also equally nice that no one had to worry about driving while we were in an emotional state. I was very happy that the “Family Coach” was an option. - Nancy K.
Our immediate family was able to be together and that made it relaxing. It eased the pain of why we were there. - Maggie M.